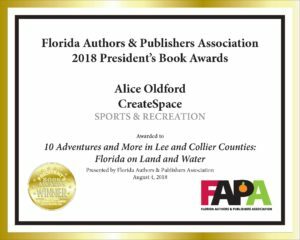 Alice Oldford – Book Award – Gulf Coast Writers Association My latest book "10 Adventures . . ." won a gold medal from Florida Authors and Publishers Association in the Sports and Recreation category. My latest book “10 Adventures . . .” won a gold medal from Florida Authors and Publishers Association in the Sports and Recreation category.